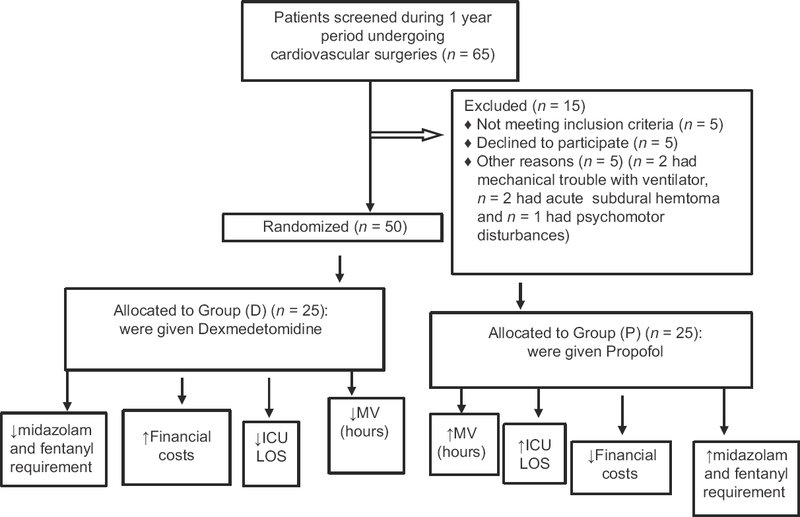 Objective: The objective of this study was to compare the suitability (efficacy and safety) of dexmedetomidine versus propofol for patients admitted to the intensive care unit (ICU) after the cardiovascular surgery for the postoperative sedation before weaning from mechanical ventilation. Background: Sedation is prescribed in patients admitted to the ICU after cardiovascular surgery to reduce the patient discomfort, ventilator asynchrony, to make mechanical ventilation tolerable, prevent accidental device removal, and to reduce metabolic demands during respiratory and hemodynamic instability. Careful drug selection for sedation by the ICU team, postcardiovascular surgery should be done so that patients can be easily weaned from mechanical ventilation after sedation is stopped to achieve a shorter duration of mechanical ventilation and decreased the length of stay in ICU. Methods: A total of 50 patients admitted to the ICU after cardiovascular surgery, aged from 18 to 55 years and requiring mechanical ventilation on arrival to the ICU were enrolled in a prospective and comparative study. They were randomly divided into two groups as follows: Group D patients (n = 25) received dexmedetomidine in a maintenance infusion dose of 0.8 μg/kg/h and Group P patients (n = 25) received propofol in a maintenance infusion dose of 1.5 mg/kg/h. The patients were assessed for 12 h postoperatively, and dosing of the study drug was adjusted based on sedation assessment performed with the Richmond Agitation-Sedation Scale (RASS). The patients were required to be within the RASS target range of −2 to +1 at the time of study drug initiation. At every 4 h, the following information was recorded from each patient such as heart rate (HR), mean arterial pressure (MAP), arterial blood gases (ABG), tidal volume (TV), exhaled TV, maximum inspiratory pressure, respiratory rate and the rapid shallow breathing index, duration of mechanical ventilation, midazolam and fentanyl dose requirements, and financial costs. Results: The study results showed no statistically significant difference between both groups with regard to age and body mass index. Group P patients were more associated with lower MAP and HR than Group D patients. There was no statistically significant difference between groups with regard to ABG findings, oxygenation, ventilation, and respiratory parameters. There was significant difference between both the groups in midazolam and fentanyl dose requirement and financial costs with a value of P < 0.05. Conclusion: Dexmedetomidine is safer and equally effective agent for the sedation of mechanically ventilated patients admitted to the ICU after cardiovascular surgery compared to the patients receiving propofol, with good hemodynamic stability, and equally rapid extubation time. Background: Acute aneurysmal subarachnoid hemorrhage (aSAH) is a potentially devastating event often presenting with a plethora of hemodynamic fluctuations requiring meticulous fluid management. The aim of this study was to assess the utility of newer dynamic predictors of fluid responsiveness such as Delta down (DD), superior vena cava collapsibility index (SVCCI), and aortic velocity time integral variability (VTIAoV) in patients with SAH undergoing neurosurgery. Materials and Methods: Fifteen individuals with SAH undergoing surgery for intracranial aneurysmal clipping were enrolled in this prospective study. Postinduction, vitals, anesthetic parameters, and the study variables were recorded as the baseline. Following this, patients received a fluid bolus of 10 ml/kg of colloid over 20 min, and measurements were repeated postfluid loading. Continuous variables were expressed as mean ± standard deviation and compared using Student's t-test, with a P < 0.05 considered statistically significant. The predictive ability of variables for fluid responsiveness was determined using Pearson's coefficient analysis (r). Results: There were 12 volume responders and 3 nonresponders (NR). DD >5 mm Hg was efficient in differentiating the responders from NR (P < 0.05) with a sensitivity and specificity of 90% and 85%, respectively, with a good predictive ability to identify fluid responders and NR; r = 0.716. SVCCI of >38% was 100% sensitive and 95% specific in detecting the volume status and in differentiating the responders from NR (P < 0.05) and is an excellent predictor of fluid responsive status; r = 0.906. VTIAoV >20% too proved to be a good predictor of fluid responsiveness, with a sensitivity and specificity of 100% and 90%, respectively, with a predictive power; r = 0.732. Conclusion: Our study showed that 80% of patients presenting with aSAH for intracranial aneurysm clipping were fluid responders with normal hemodynamic parameters such as heart rate and blood pressure. Among the variables, SVCCI >38% appears to be an excellent predictor followed by VTIAoV >20% and DD >5 mmHg in assessing the fluid status in this population. Objective: To assess the roles of demographic factors, actual and perceived risk factors, and perceived control in the referral to cardiac rehabilitation (CR) after coronary artery bypass graft (CABG). Methods: In this cross-sectional study, data related to 312 CABG patients in a hospital of the Western part of Iran, gathered through demographics and actual risk factors' checklist, open single item of perceived heart risk factors, life stressful events scale, and perceived control questionnaire. Data analyzed by binary logistic regression. Results: The results showed that only 8.3% of CABG patients refer to CR. The facilitators of this referral included official employment (P < 0.05), coronary history (P = 0.016), and hyperlipidemia (P = 0.030) but more distance to the CR center (P = 0.042) and perceived physiological risk factor (P = 0.025) are concerned as the barriers for the referral to CR. Conclusion: Providing appropriate awareness about the benefits of CR for patients with regard to their job status, coronary history, and perception about the illness risk factors can be effective in referral to CR. In addition, the presence of CR centers in towns and facilitated achievement to these centers can play a significant role in patients' participation. Purpose: Our prospective, randomized clinical study aims to evaluate the utility of intraoperative transesophageal echocardiography (TEE) in patients undergoing radical cystectomy. Materials and Methods: Eighty patients were randomized to a standard of care group or the intervention group that received continuous intraoperative TEE. Data are presented as means ± standard deviations, median (25th percentile, 75th percentile), or numbers and percentages. Characteristics were compared between groups using independent sample t-tests, Wilcoxon–Mann–Whitney tests or Chi-square tests, as appropriate. All tests were two-sided and P < 0.05 was considered to indicate statistical significance. Results: Both groups had similar preoperative demographic characteristics. There was a significant difference between central line insertion with all insertions in the control group (15%, 6 vs. 0%, 0; P < 0.003). Of all the perioperative complications, 80% occurred in the control group versus 20% in the TEE group, with 21% of controls experiencing a cardiac or pulmonary complication compared to 5% in the TEE group (8 vs. 2, P < 0.04). The control group patients were more likely to have adverse cardiac complications than the TEE group (15%, 6 vs. 3%, 1; P < 0.040). 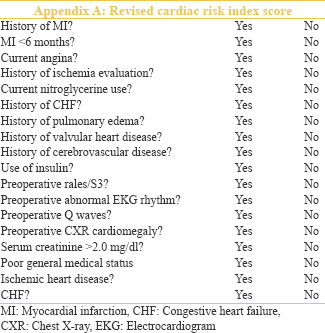 Postoperative cardiac arrhythmia was observed only in the control group (13%, 5 vs. 0%, 0; P <.007). Prolonged intubation was only observed in the control group (10%, 4 vs. 0%, 0; P < 0.017). Conclusion: TEE can be a useful monitoring tool in patients undergoing radical cystectomy, limiting the use of central line insertion and potentially translating into earlier extubation and decreased postoperative cardiac morbidities. Background: Studies evaluating the hemostatic effects of fibrinogen administration in cardiac surgery are not conclusive. Aims: We investigated whether the use of a low-dose human fibrinogen in case of clinical bleeding after protamine administration and concomitant low FIBTEM values is effective in reducing postoperative bleeding. Secondary end-point was to investigate the consumption of allogeneic blood products. Setting and Design: This was a retrospective matched study conducted at university hospital. Materials and Methods: Among 2257 patients undergoing surgery with cardiopulmonary (CPB) bypass, 73 patients received a median dose of 1 g human fibrinogen (ROTEM-Fibri group). This group was matched with 73 patients who had not received human fibrinogen (control group) among 390 patients having undergone surgery at the moment FIBTEM analysis was unavailable. Statistical Analysis: Matching was performed for the type and the presence of redo surgery. McNemar and Wilcoxon paired tests were used to respectively compare the categorical and quantitative variables. Results: The CPB bypass time was significantly higher in the ROTEM-Fibri group (P = 0.006). This group showed significantly higher bleeding in the first 12 and 24 h postoperatively (P < 0.001) and required significantly more transfusion of blood products (P < 0.001) and surgical revision (P = 0.007) when compared with the control group. There was no significant difference in the number of thromboembolic complications. Conclusions: These results show that the administration of 1 g of fibrinogen based on low-FIBTEM values and clinical bleeding after protamine administration does not stop bleeding and the need for transfusion of allogeneic blood products. Background: Blood transfusion requirement during neonatal open heart surgeries is universal. Homologous blood transfusion (HBT) in pediatric cardiac surgery is used most commonly for priming of cardiopulmonary bypass (CPB) system and for postoperative transfusion. To avoid the risks associated with HBT in neonates undergoing cardiac surgery, use of autologous umbilical cord blood (AUCB) transfusion has been described. 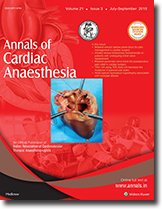 We present our experience with the use of AUCB for neonatal cardiac surgery. Designs and Methods: Consecutive neonates scheduled to undergo cardiac surgery for various cardiac diseases who had a prenatal diagnosis made on the basis of a fetal echocardiography were included in this prospective observational study. After a vaginal delivery or a cesarean section, UCB was collected from the placenta in a 150-mL bag containing 5 mL of citrate–phosphate–dextrose–adenine-1 solution. The collected bag with 70–75 mL cord blood was stored at 2°C–6°C and tested for blood grouping and infections after proper labeling. The neonate's autologous cord blood was used for postcardiac surgery blood transfusion to replace postoperative blood loss. Results: AUCB has been used so far at our institute in 10 neonates undergoing cardiac surgery. The donor exposure in age and type of cardiac surgery-matched controls showed that the neonates not receiving autologous cord blood had a donor exposure to 5 donors (2 packed red blood cells [PRBCs], including 1 for CPB prime and 1 for postoperative loss, 1 fresh frozen plasma, 1 cryoprecipitate, and 1 platelet concentrate) compared to 1 donor for the AUCB neonate (1 PRBC for the CPB prime). Postoperative blood loss was similar in both the groups of matched controls and study group. Values of hemoglobin, total leukocyte count, platelet counts, and blood gas parameters were also similar. Conclusions: Use of AUCB for replacement of postoperative blood loss after neonatal cardiac surgery is feasible and reduces donor exposure to the neonate. Its use, however, requires a prenatal diagnosis of a cardiac defect by fetal echo and adequate logistic and psychological support from involved clinicians and the blood bank. 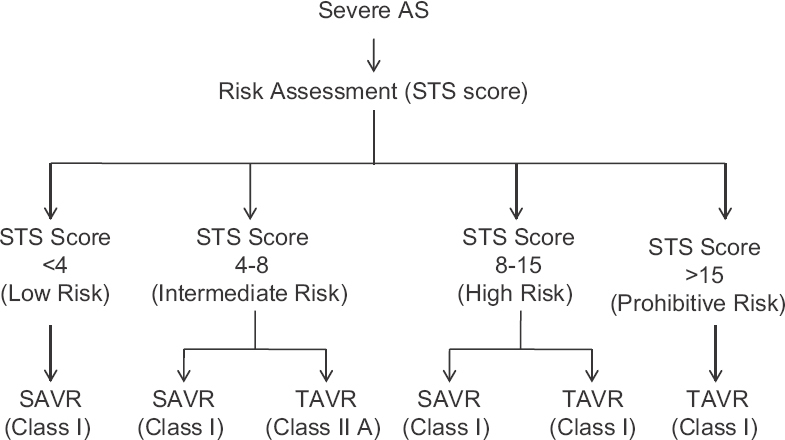 Background: Transcatheter aortic valve implantation (TAVI) is a valid option for patients with severe aortic stenosis judged to be at high surgical risk. For this procedure, there is no agreement on the appropriate type of anesthesia. Sedation offers several advantages, but general anesthesia (GA) leads to less paravalvular leaks (PVLs) probably because of the transesophageal echocardiography (TEE) guidance. The objective was to compare the incidence of PVL among patients receiving conscious sedation (TAVI-S) and patients receiving GA (TAVI-GA). We made the hypothesis that a referral center does not necessitate TAVI-GA to reduce the incidence of moderate-to-severe PVL. Aim: The primary outcome was the incidence of moderate-to-severe PVL at 30 days after the implantation. Design and Setting: This study design was a retrospective observational trial in a university hospital. 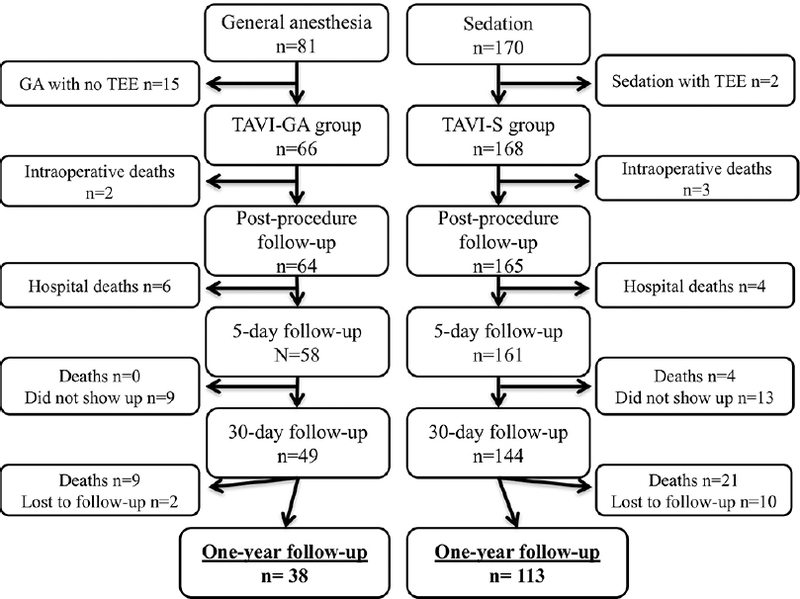 Methods: The TAVI-S group underwent the procedure under conscious sedation. In the TAVI-GA group, an endotracheal tube and a TEE probe were inserted. After the valve deployment, PVL was assessed by hemodynamic and fluoroscopic measurements in the TAVI-S group. TEE was also used in the TAVI-GA group to evaluate the presence of PVL. When PVL was moderate or severe according to the Valve Academic Research Consortium criteria. Results: TAVI-S and TAVI-GA were accomplished in 168 (67.5%) and 81 (32.5%) patients, respectively. Our results show no difference between the two groups regarding the incidence and grade of PVL. Conclusion: Performing TAVI under GA with TEE guidance is not associated with a lower incidence of moderate and severe PVL. Cyanosis due to right to left shunt across an atrial septal defect (ASD) brings up lots of questions in an inquisitive mind! Systemic desaturation at rest or during exercise can limit physical ability and impair the quality of life of patients with congenital heart defect (CHD). Traditionally, ASD is taught as an acyanotic CHD, but we encountered a child with a different clinical presentation. Understanding the mechanism of early onset systemic desaturation in the presence of an ASD is vital for surgical planning and decision-making. A comprehensive TEE examination always compliments clinical and haemodynamic data for an aetiology based patient management. This brief clinical communication attempts to discuss the role of perioperative TEE examinations in a case of ASD with central cyanosis. Pericardiocentesis is a challenging procedure and complications may vary depending on the patient-specific risk factors and procedural indications. 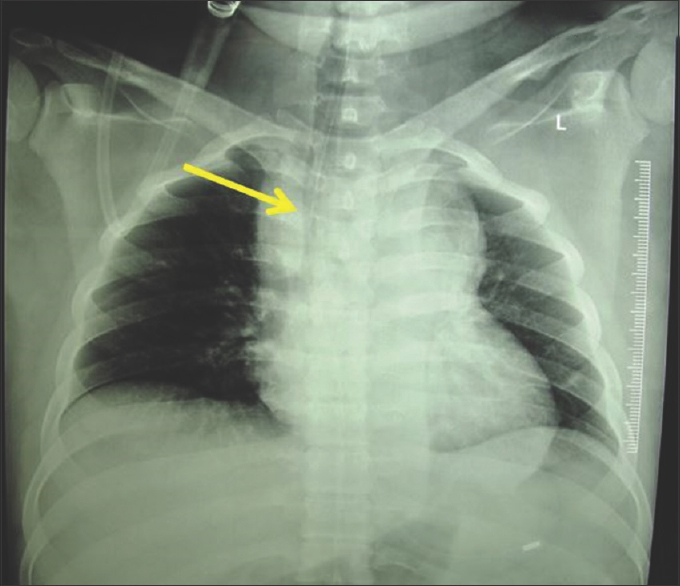 Cardiac chamber perforation and the subsequent insertion of pigtail catheter into the main pulmonary artery are an unreported mishap during attempted pericardiocentesis. 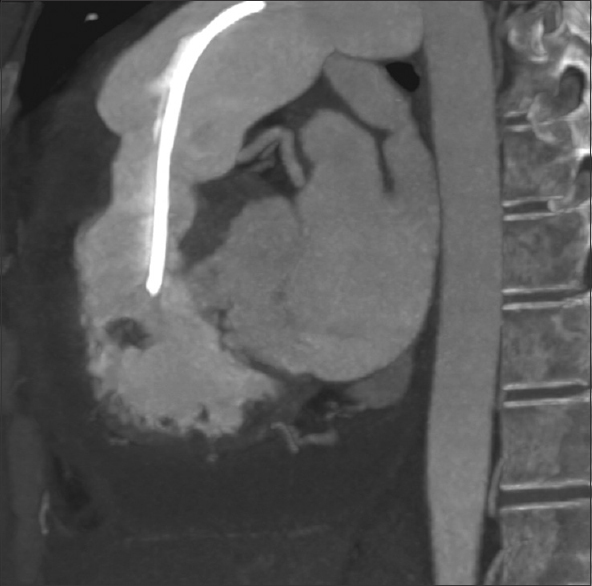 This potentially life-threatening complication is completely preventable by identification of high-risk patients and appropriate use of available technologies. Adjunctive imaging decreases procedural risk for difficult-to-access pericardial fluid collections and must be used to prevent inadvertent morbidities. Pulmonary vein obstruction is rare condition characterized by challenging diagnosis and unfavorable prognosis at advanced stage. 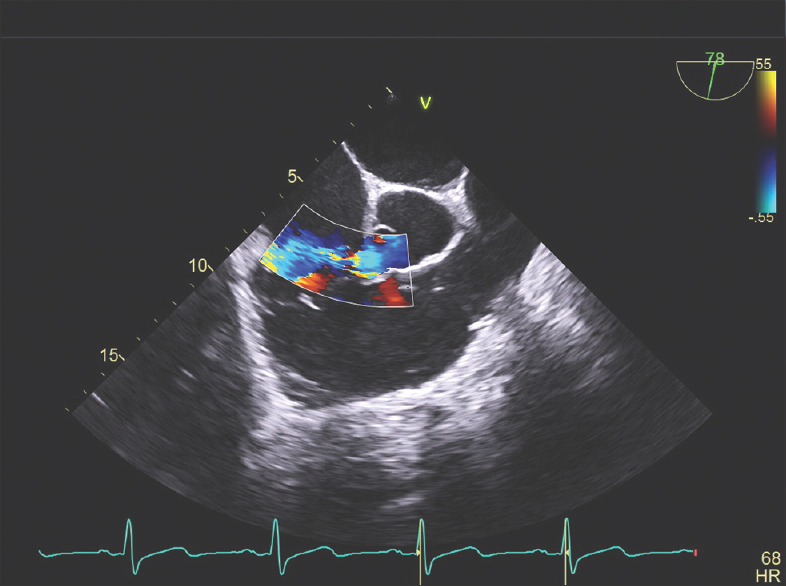 Computerized tomography, magnetic resonance imaging, and transesophageal echocardiography (TEE) are often essential to reach a final diagnosis. External compression of pulmonary vein resulting from the mass effect of pseudoaneurysm and perianeurysmal hematoma due to aortic transection is extremely rare. 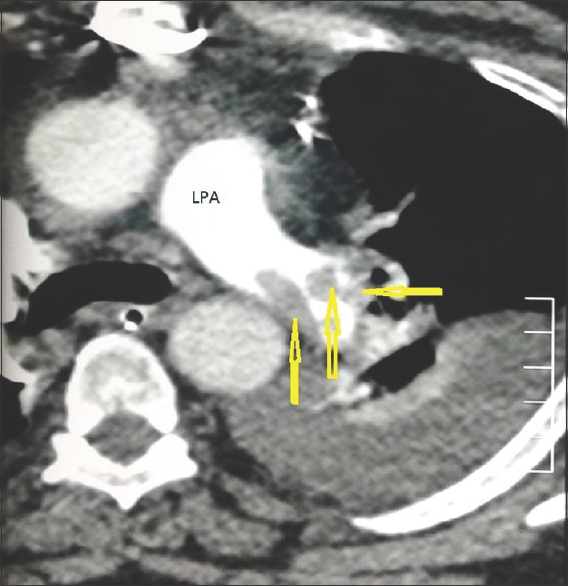 We describe a case of traumatic transection of descending thoracic aorta where TEE was instrumental in the diagnosis of left upper pulmonary vein obstruction and help in the modification of the surgical plan. Left atrial dissection (LatD) is a rare complication of cardiac surgery due to creation of a false chamber through a tear in the mitral valve annulus that extends into the left atrium wall. It is primarily associated with mitral valve surgery although other etiologies have also been defined. 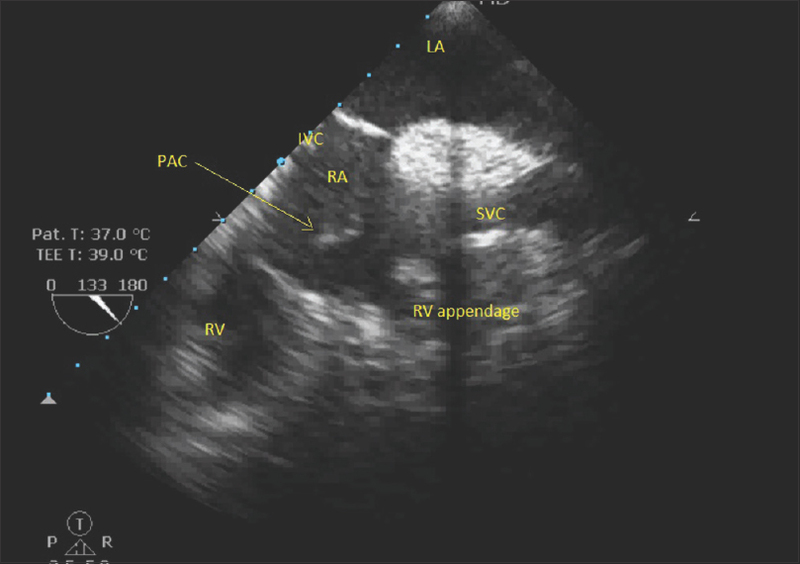 Perioperative transesophageal echocardiography (TEE) is a key to the diagnosis. 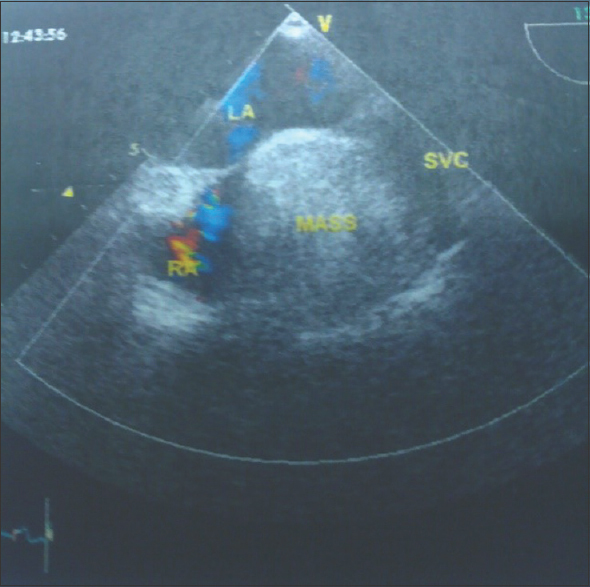 This is a case report of management of LatD after mitral valve replacement. 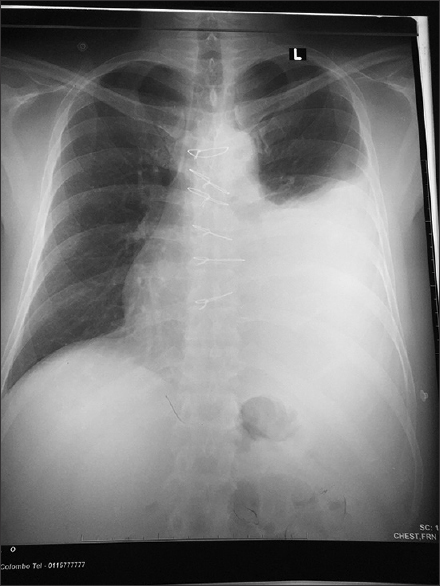 Chylothorax is a rare complication after cardiac surgery but is associated with morbidity and mortality. The most common cause of chylothorax is damage to or avulsion of thoracic duct by electrocautery during left internal thoracic artery harvesting for coronary artery bypass graft (CABG) surgery. We describe a case of chylothorax after off-pump CABG, which was successfully treated with thoracostomy tube drainage, withholding of oral intake, total parenteral nutrition and subcutaneous octreotide, a somatostatin analog, and chemical pleurodesis. Congenital Bochdalek diaphragmatic hernia (DH) is often diagnosed incidentally in adulthood. It is recommended that all cases of DH be repaired immediately at diagnosis since acute presentation after the complications have already developed has higher morbidity and mortality. A 47-year-old male presented with Grade III angina and dyspnea. A routine chest radiograph revealed bowel shadows in the right thorax, and subsequent computerized tomography (CT) scan confirmed the same. Coronary angiogram revealed coronary artery disease which needed surgery. Off-pump coronary artery bypass grafting followed by DH repair under one-lung ventilation. A 77-year-old man was admitted for aortic valve replacement and combined coronary bypass grafting. Grossly, labile arterial pressures were demonstrated on anesthetic induction prompting cancellation and Intensive Care Unit transfer. Urine analysis identified high normetadrenaline/creatinine ratio, plasma metanephrine, and plasma normetanephrine. A left adrenal lesion on computed tomography scan collectively indicated pheochromocytoma. Laparoscopic adrenalectomy was prioritized at multidisciplinary team before cardiac surgery. Vague symptoms of pheochromocytoma pose a diagnostic problem, being often attributed to common/co-existing pathology. The blood pressure instability on anesthetic required precise control, multidisciplinary input, and awareness of possible diagnosis as a routine intervention for hypotension may have been fatal in view of underlying cardiac pathology. Hypokalemia is defined as serum potassium level less than 3.5 mEq/L. When the serum level of potassium is less than 3 mEq/L, intravenous potassium supplementation is warranted. A 23 yr old adult female with complaints of dyspnoea (NYHA II) since 6 yrs, dyspnoea (NYHA III) and paroxysmal nocturnal dyspnoea on and off since 2 months, diagnosed with severe mitral stenosis, was posted for mitral valve replacement. After the release of ACC, ECG revealed sine wave pattern, Transesophageal echocardiographic examination revealed global hypokinesia and ABG showed potassium of 2.3 mEq/L. Hypokalemia in cardiac patients can occur due to the effect of poor oral intake, increased renal loss by the secondary hyperaldosteronism in congestive heart failure, loss due to use of digoxin and diuretics like thiazide diuretics, loop diuretics etc. Hypokalemia should be avoided while weaning off cardiopulmonary support as it can lead to atrial and ventricular arrhythmias. Potassium ion is very important for the normal contractility of the heart. Hypokalemia if refractory to intravenous potassium supplementation, concomitant magnesium deficiency should be suspected and treated. 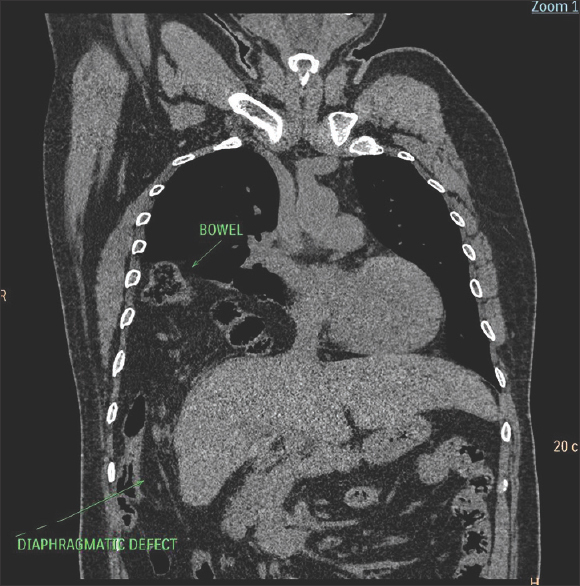 We present the case of a 37 year old male who presented with new onset dyspnea, tachycardia, palpitations, and chest tightness. His initial work up demonstrated a dilated pulmonary artery with reflux of contrast dye in to the IVC. 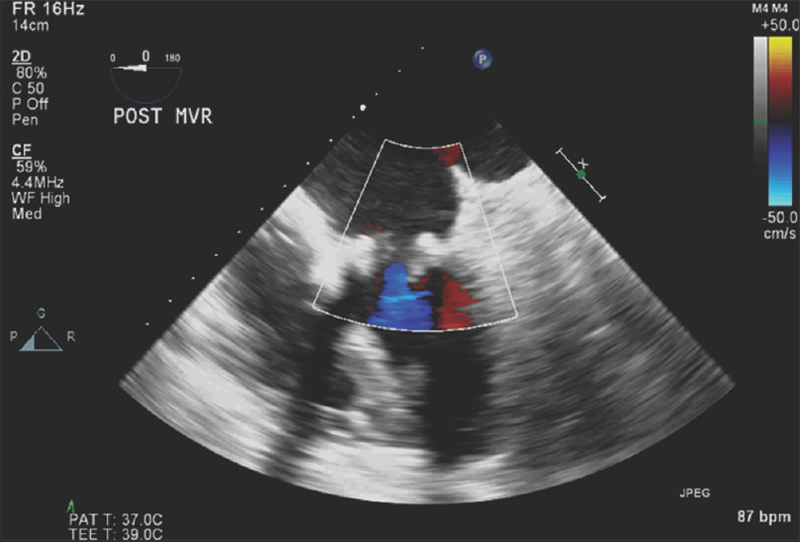 Transthoracic echocardiogram identified a “windsock” appearance indicating Sinus of Valsalva aneurysm (SVA) and severe aortic regurgitation. As a result, the patient was taken for emergent surgery where the windsock tissue was surgically repaired with bovine pericardial patch. 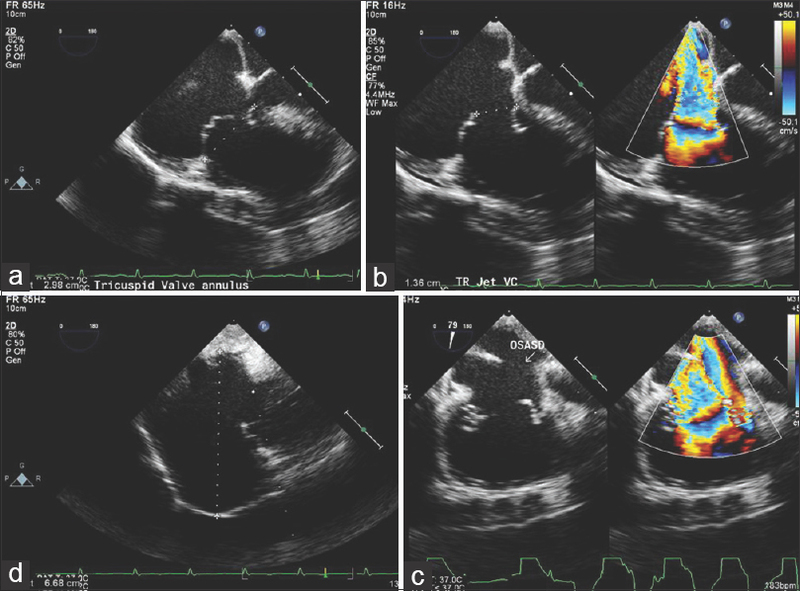 This case illuminates the uncommon occurrence of SVA and the ability to recognize these findings on multiple imaging modalities including transthoracic, transesophageal two and three dimensional echocardiography as well as direct surgical field visualization. 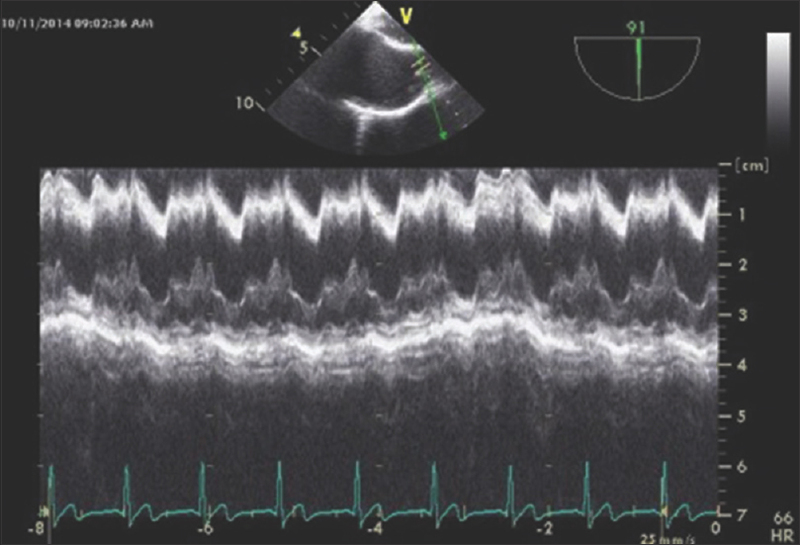 Hypertrophic obstructive cardiomyopathy is a relatively common disorder that signifies asymmetric hypertrophy of interventricular septum causing obstruction of the left ventricular outflow tract (LVOT). However, more recent studies have shown that during ventricular systole, flow against an abnormal mitral valve apparatus results in drag forces on the part of the leaflets. The mitral leaflet is pushed into the LVOT to obstruct it. 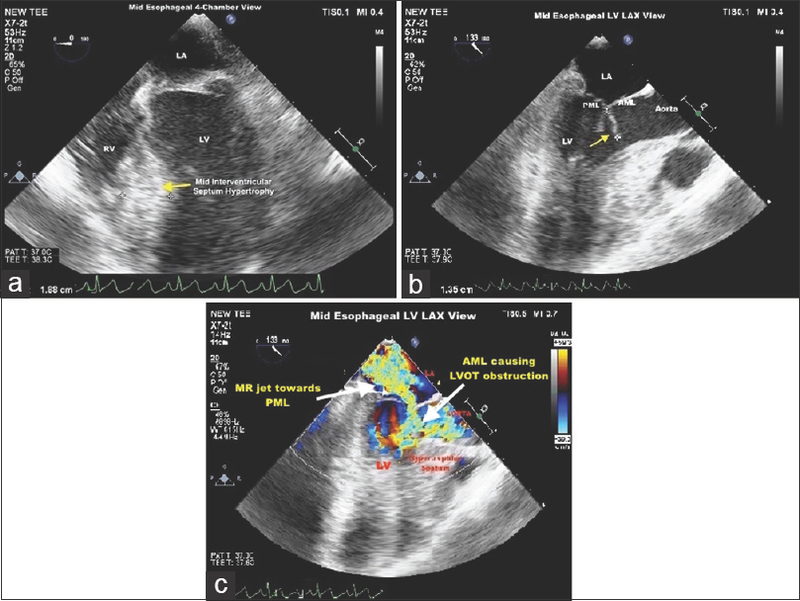 We present a case where intraoperative transesophageal echocardiography played a crucial role in defining the etiology of LVOT obstruction that subsequently helped in deciding the surgical plan. Lipomatous hypertrophy of atrial septum (LHAS) is a rare benign cardiac condition characterized by fatty tissue infiltration located in the atrial septum. We presented a rare case of LHAS resulting in recurrent syncopal attacks. 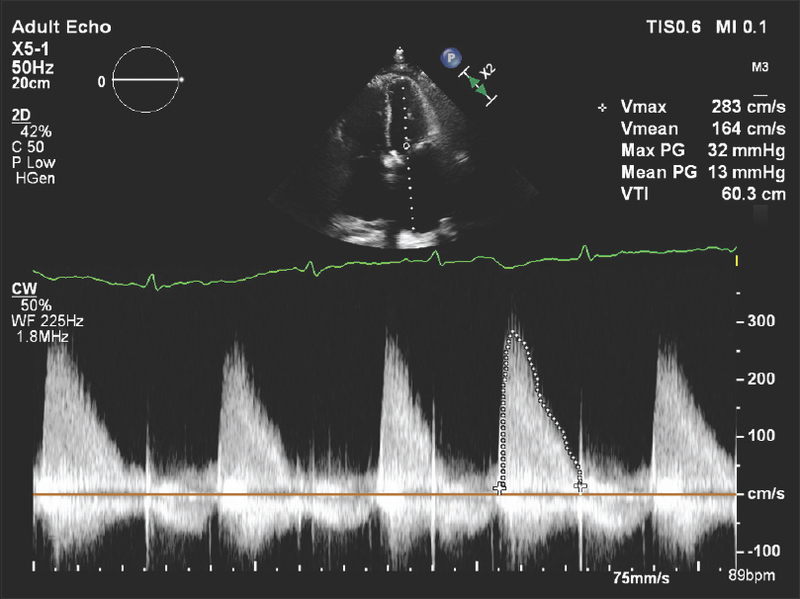 High Doppler valve gradient is generally suggestive of valve thrombosis. However, it should be corroborated with the finding of restricted leaflet movement to confirm the diagnosis. In the present case, abnormally high gradient was not associated with limited leaflet movements or any valve thrombus. 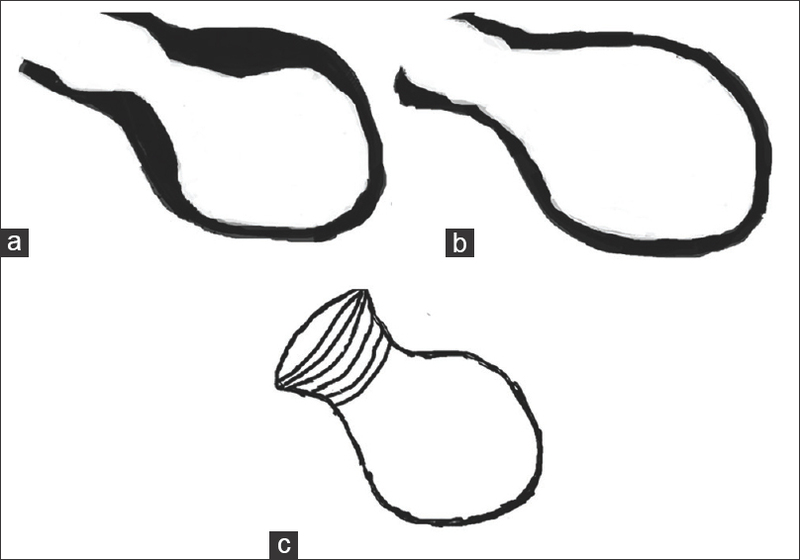 Objective: Continuous thoracic epidural analgesia (TEA) is compared with erector spinae plane (ESP) block for the perioperative pain management in patients undergoing cardiac surgery for the quality of analgesia, incentive spirometry, ventilator duration, and intensive care unit (ICU) duration. Methodology: A prospective, randomized comparative clinical study was conducted. A total of 50 patients were enrolled, who were randomized to either Group A: TEA (n = 25) or Group B: ESP block (n = 25). Visual analog scale (VAS) was recorded in both the groups during rest and cough at the various time intervals postextubation. Both the groups were also compared for incentive spirometry, ventilator, and ICU duration. Statistical analysis was performed using the independent Student's t-test. A value of P < 0.05 was considered statistically significant. Results: C omparable VAS scores were revealed at 0 h, 3 h, 6 h, and 12 h (P > 0.05) at rest and during cough in both the groups. Group A had a statistically significant VAS score than Group B (P ≤ 0.05) at 24 h, 36 h, and 48 h but mean VAS in either of the Group was ≤4 both at rest and during cough. Incentive spirometry, ventilator, and ICU duration were comparable between the groups. Conclusion: ESP block is easy to perform and can serve as a promising alternative to TEA in optimal perioperative pain management in cardiac surgery. Context: Inhaled levosimendan may act as selective pulmonary vasodilator and avoid systemic side effects of intravenous levosimendan, which include decrease in systemic vascular resistance (SVR) and systemic hypotension, but with same beneficial effect on pulmonary artery pressure (PAP) and right ventricular (RV) function. Aim: The aim of this study was to compare the effect of inhaled levosimendan with intravenous levosimendan in patients with pulmonary hypertension undergoing mitral valve replacement. Settings and Design: The present prospective randomized comparative study was conducted in a tertiary care hospital. Subjects and Methods: Fifty patients were randomized into two groups (n = 25). Group A: Levosimendan infusion was started immediately after coming-off of cardiopulmonary bypass and continued for 24 h at 0.1 mcg/kg/min. Group B: Total dose of levosimendan which would be given through intravenous route over 24 h was calculated and then divided into four equal parts and administered through inhalational route 6th hourly over 24 h. Hemodynamic profile (pulse rate, mean arterial pressure, pulmonary artery systolic pressure [PASP], SVR) and RV function were assessed immediately after shifting, at 1, 8, 24, and 36 h after shifting to recovery. Statistical Analysis Used: Intragroup analysis was done using paired student t-test, and unpaired student t-test was used for analysis between two groups. Results: PASP and RV-fractional area change (RV-FAC) were comparable in the two groups at different time intervals. There was a significant reduction in PASP and significant improvement in RV-FAC with both intravenous and inhalational levosimendan. SVR was significantly decreased with intravenous levosimendan, but no significant decrease in SVR was observed with inhalational levosimendan. Conclusions: Inhaled levosimendan is a selective pulmonary vasodilator. It causes decrease in PAP and improvement in RV function, without having a significant effect on SVR. Background: Good postoperative analgesia in cardiac surgical patients helps in early recovery and ambulation. 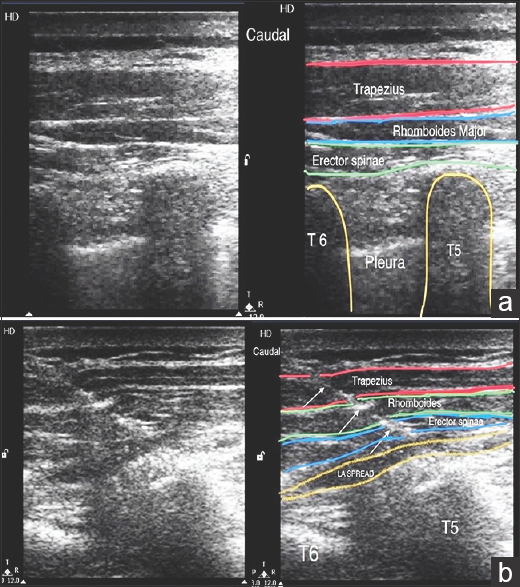 An alternative to parenteral, paravertebral, and thoracic epidural analgesia can be pectoralis nerve (Pecs) block, which is novel, less invasive regional analgesic technique. Aims: We hypothesized that Pecs block would provide superior postoperative analgesia for patients undergoing cardiac surgery through midline sternotomy compared to parenteral analgesia. Materials and Methods: Forty adult patients between the age groups of 25 and 65 years undergoing coronary artery bypass grafting or valve surgeries through midline sternotomy under general anesthesia were enrolled in the study. Patients were randomly allocated into two groups with 20 in each group. Group 1 patients did not receive Pecs block, whereas Group 2 patients received bilateral Pecs block postoperatively. Patients were extubated once they fulfilled extubation criteria. Ventilator duration was recorded. Patients were interrogated for pain by visual analog scale (VAS) scoring at rest and cough. Inspiratory flow rate was assessed using incentive spirometry. Results: Pecs group patients required lesser duration of ventilator support (P < 0.0001) in comparison to control group. Pain scores at rest and cough were significantly low in Pecs group at 0, 3, 6, 12, and 18 h from extubation (P < 0.05). At 24 h, VAS scores were comparable between two groups. Peak inspiratory flow rates were higher in Pecs group as compared to control group at 0, 3, 6, 12, 18, and 24 h (P < 0.05). Thirty-four episodes of rescue analgesia were given in control group, whereas in Pecs group, there were only four episodes of rescue analgesia. Conclusion: Pecs block is technically simple and effective technique and can be used as part of multimodal analgesia in postoperative cardiac surgical patients for better patient comfort and outcome.